How bad Charlton's financial predicament is continues to manifest itself with news this morning that Addick's legend Steve Gritt has left the club due to further cost-cutting. 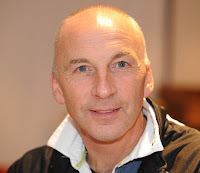 Gritty had been the Academy Manager for 6 years so his departure will throw into doubt the long-term future of it, although Richard Murray has said that the club will be keeping the academy for at least two more years, which would coincide with the end of KRBS' sponsorship arrangement. Murray said: "(Steve's) history with the club speaks for itself and it's a very sad day when the club is in a position where we have to make these kinds of decisions. In all the discussions that will take place across many fronts this summer, we are putting the future of the club first, and hopefully by taking painful decisions such as this one, we can strengthen the long-term prospects of the club." One would imagine that long-term youth coach Damian Matthew will add the academy manager's role to his current one of development coach. Many would like to see Matthew take a role with the first team. Gritty has been around the club for almost as long as I have supported it, and for me this is another sad day in one of many over the past three years. So the future of Fabio Capello is in the hands of the FA's Sir Dave Richards, the same bloke who three weeks ago tied the Italian to a two-year £9.6m contract. With idiots like Richards, a spectacularly failed businessman deciding 'Club England's' future we have no flipping chance. Capello did appear like a deer in the headlights before and during the tournament, the media and player pressures clearly exceeding those he previously dealt so well with in club football. It doesn't look like he will walk away, probably something to do with that £9.6m, but Richards' declaration of a two-week cooling off period is hardly a vote of confidence. Capello made plenty of mistakes post qualification culminating in introducing that goal-magnet Emile Heskey to the fray when we were two-goals down on Sunday but in England it's always very easy to blame the manager, the media protect narcissistic players and transplant vegetables for managers heads on their back pages but the blame is undoubtedly with the players hero-worshipped by only themselves, agents and sycophantic hangers on. If I saw Chris Solly in the street I would ask for his autograph, if I saw John Terry I would give the bloke a mouthful. George W Bush was once elected because Americans felt they could have a beer with him. Who would you want to share a pint of lager with out of that lot? David James, Joe Cole, Lampard maybe? If he brought his girlfriend? Of course these players are the devil spawn of the Premier League, whose chairman is, oh hang on Sir Dave Richards. The richest league in the world with one Champions League title in the past 5 years and not a Europa Cup or whatever it's called winner since 2001, and in it's 18 years of existence the FAPL has delivered an English national team that we are embarrassed by. The Golden Generation eh? Only in their pension funds. Until the Premier League stops paying it's clubs and it's players every penny they can squeeze out of corporations, television viewers and supporters and money starts to flow back down the pyramid then nothing will improve. But there are so many things wrong with the game me and you used to love, before prawn sandwiches replaced bovril as a half-time snack. From kids getting screamed at by parents dressed as coaches on the touchline to "get stuck in" or results driven Premier League academies being chock full of young foreign hopefuls, whilst the best young kids with a diamond in their ear and a BMW in the car park stagnate on the sidelines. The harbour at Hamilton has been a wave of colour this week as hundreds of flags fly over a flotilla of yachts sitting pretty waiting their next journey after the Newport to Bermuda Race. The first yacht to reach Bermuda appeared over the reefs at St David's head at daylight on Tuesday morning. The 100-foot sloop called Speedboat with a crew of 25 led for most of the race and completed the course in 59 hours. However being first over the line does not constitute a winner as there are 5 different divisions and 16 classes. The first crew into Bermuda does have the benefit though of spending more, er shall we say leisure time in Hamilton, unlike a guy I met on Thursday whose boat Atalanta came in that morning. To say he was exhausted and thirsty was an understatement! Rick Everitt posted the following this morning on Charlton Life. Please read and feel free to add comments or email Rick at votv@btinternet.com. The club need to make a decision before the end of June. "Someone asked recently about the promised redesign of the OS, which we all accept is now looking rather dated. The reality is that we look like being forced down a road we do not want to travel, so rather than present this as a done deal here is the situation we face. The strong and consensus view within the club is that we want to maintain an independent site. Other than attendance at matches, it is the main point of contact for fans. It is the principle way the club communicates and it acts as our shop window. And who in the high street would deliberately set out to have a shop window that looked like all the others? We have never seen it and don’t see it now as just another piece of inventory to sell off to the highest bidder. It is a vital part of our identity. On the other side of the equation is Football League Interactive, a subsidiary of the Football League, which operates about 80 websites, including the sites of all other FL clubs – barring Leeds United and recent arrivals in the League from either end. There are good reasons for this dominance and they are financial. By bringing all those clubs together, FLi is able to make an attractive pitch to advertisers and share the revenue according to size of club. More significantly, from our point of view, the League controls the rights to live action – commentary and video – and licences it in such a way that it is very difficult to escape the financial logic of handing over your website. Two years ago, in response to the demand from fans for commentary, the club entered into a deal with FLi that enables us to stream commentary (provided by us) and match highlights (provided by them). No other club has such an arrangement outside of an FLi website and to get them to agree to this we had to accept terms that are overwhelmingly in their favour. They get the vast majority of the revenue Charlton fans pay. The contract is up and they have made clear that the terms of an extension are non-negotiable. If we give up the independence of our site we get a more equitable share of this revenue, plus a a cut of the advertising, plus a share of the syndication money the League gets from selling the internet video rights on, for example to the BBC, based on the number of Player subscribers we have. At the moment we get a flat rate of the syndication based on League One status, although our website traffic is healthy and hasn’t fallen since we were relegated from the PL. We would no longer have to pay hosting or design costs, although they don’t offer a shop or tickets interface and these would remain under our control. Against this, our site would look like the other FLi sites. Our staff would still maintain the club specific content, but we would have less control of how it looks, our messages would have less prominence and there are restrictions on the ways we can prioritise our own commercial activities, for example with splash pages. In addition, the contract ties us to this arrangement until 2017. This is also non-negotiable. There is nobody at Charlton who want to wants to go down this route, but our research suggests it is worth a minimum of £50k extra a season to do so. Given that we are faced with making people redundant to save much less than this, we have build a credible alternative financial model if we are to avoid it. That is going to need the active support of fans to achieve. Hence this post and the question - do enough of you care sufficiently to help us fund the alternative? We have plans in place to rebuild the existing site now in a much updated and improved form and continue to host it independently, but that is a cost. The only secure way of offsetting that and matching the income stream from FLi is through subscriptions, but it would make little sense in view of the values we attach to the site to put it behind a paywall. The subscriptions need to be attached to premium content. Again the League will take a significant (but much lower) share of the income just to allow us the rights to include this live action and we would have to obtain our own match footage and edit it. We believe the main driver of subscriptions was match commentary rather than match pictures, not least because these are also available in limited form via the BBC site. Are we correct about this? Again, you can tell us. The simplest option would be to offer a premium content service with no commentary or match action as the League cannot demand a cut of that, but even if we offer two packages and exclude premium content from one they are likely to demand a cut of both through the terms of their licence. Whichever route we go we are likely to focus on adding more non-match video content in order to encourage subscriptions, but to take the independent route we probably need more like 2,000 subscribers than the existing 1,200. And to stay independent we might have to push the price up, probably to £4 or £5 a month. Bear in mind also that all payments include VAT and we will incur additional hosting and bandwidth costs if we run our own premium content service. We do have some ideas around advertising and sponsorship, but experience suggests they should be discounted for the purposes of the current calculation. In the end, the board will have to make a decision with finance in mind. They have consistently supported our resistance to the FLI route in the past and recognise the importance of preserving our identity, but cannot be expected to do so regardless of cost. There will be people out there who are as passionate as those of us at the club are about this, but how many of you are there? 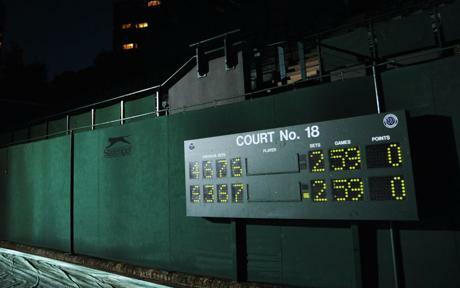 John Isner and Nicolas Mahut shortly resume their incredible 1st Round Wimbledon match, one that has so far lasted 10 hours and with the 5th set tied at 59-59. Both players, but the 6 ft 9 inch Isner particularly looked absolutely dead on their feet as the match was abandoned due to the impending night. The 5th set alone has lasted more than 7 hours and you my admiration for professional tennis players increased a few more notches yesterday. Interestingly only at Wimbledon, Roland Garros and in Melbourne is there no tie-break in the final set. In America, where the TV companies and spectators lust for a winner they abandoned the idea a long time ago. John McEnroe asked for the game, which is now on it's 3rd day, to resume on Centre Court this afternoon in front of The Queen and for both players that would be a fitting tribute to these two gladiators whose names will long live in the record books. Meanwhile in Port Elizabeth England did what they had to do and beat Slovenia to qualify for the 2nd Round. We all breathed a huge sigh of relief but was anyone else slightly embarrassed that we were taking the ball into the corner with ten minutes left against the smallest nation at the competition? Many of us have been underwhelmed by Charlton's list of pre-season friendlies (see bottom). Last year I broke with tradition and went to the Bournemouth game because I was at home, my son wanted to go and I was Charlton starved but I haven't bothered with friendlies for 20-odd years and this summer's serving have to be the least attractive in a very long time. Yet, we find out it could have been very different if the club chose to accept Tottenham's offer of a game at The Valley. The cost of hosting the game, which one assumes would include a hefty match fee in Spurs' favour was deemed too excessive. This despite what I would think could have been a 10-12,000 attendance at an average price of a tenner a pop. Back in the dark days pre-Selhurst we played all manner of top teams in pre-season but I suppose the costs, despite the distinct possibility of crowd trouble was not a factor. It certainly underlines to those that still think we can go out and 'buy' players that we tread financially a very, very thin line. It also begs the question why Spurs are insisting on an upfront payment if true. After watching the circus that is the England squad this weekend, my despisal of all things Premier League is growing by the day! Yesterday the club announced that "a number of Charlton staff have been formally placed at risk of redundancy." This after 14 staff got made redundant a year ago. Why the club didn't make all the sacrifices together 12 months ago is strange as I don't see what winning promotion would have greatly added to our income. Markedly the departure of Moots, Waggott, Sports Scientist Nick Davies, Jonjo and the soon to leave Nicky Bailey still has dragged the club out of the doo-doo. My thoughts go to those that earn a fraction of what the players do, and put in a ruddy lot more effort and now face a very uncertain few weeks. The number of players that are actually contracted to play for us at present (I reckon) is only 12 and that includes Nicky Bailey! However today Alex Stavrinou did sign a year's contract although I did read that AFC Wimbledon have enquired about taking him on loan. 8 players contracts remain unresolved. It looks like Nicky Bailey will sign for Gordon Strachan at Middlesbrough tomorrow for £1.4m, how that fee is made up we don't know. £200k up front and the rest dependent on Boro winning the Champions League? Probably. Nonetheless Bailey moving is no surprise, all of us knew once he blazed the ball into the Covered End from the spot, it'll be his last kick of a ball in a Charlton shirt. It's a fair price though, I was expecting a lot less but competition from Celtic, Southampton and Norwich helped the board's and undoubtedly the players' negotiation position. Fortunately for me the World Cup is not just about England, in fact I find them a distraction. But for the 35,000 English supporters in Cape Town who are spending hard earned savings and taking valuable time off away from home and work they frankly deserve better than one of their heroes criticising them into a camera. How football has changed from when Gazza cried and we all cried with him. 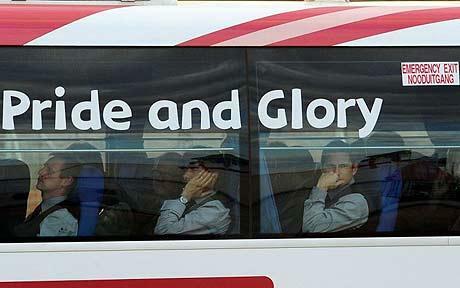 The English football world was certainly in motion then. Kenny Daglish's Liverpool had just strolled to the 1st Division title (the last time they won it), Charlton said their top division au revoir at Old Trafford, but the Valley Party's recent success had given us all renewed hope. Alex Ferguson got a reprieve from success starved United fans (they finished 13th that season five places below Wimbledon) by beating Palace in the FA Cup final and Aston Villa were on the verge of appointing the countries first ever foreign manager Jozef Vengloš, who lasted just a season. 20 years on the Premiership has changed English football for the better. Or has it? This is better. The need for points is opening up the 2nd round of group matches and throwing up some exciting games and some upsets too. The whole best team v fortunate runners up in the next round logic is all over the place at the moment with only Argentina impressing, but they are yet to be tested defensively. The French look like going home with their tales between their frogs legs. Raymond Domenech's swansong reminds me of Sven's four years ago. Even 37-year old ex-Chicago Fire stud Cuauhtemoc Blanco scored. The Mexicans would have been celebrating wildly in the streets of Chicago last night. And sacré bleu, the French press are up in arms. The L'Equipe said "No sadness, no grief, above all no anger ... You can only laugh at the fact that those players are big in the head and not so big below the belt." At least Irish eyes were smiling. Serbia turned over the Germans, who missed a penalty. Whatever next? And the USA were very unfortunate not to win earlier, Altidore's goal really should have stood and the Yanks showed great spirit in coming back aided by some inspired decision making by coach Bob Bradley. To continue the Chicago connection, Bradley was very successful when Chicago Fire's manager between 1998-2002. Incidentially I am warming to Diego Maradona. Obviously as mad as a box of frogs but football throws up too many dullards these days, and his passion is infectious. Never thought I would say that. In about an hour's time 185 yachts leave Newport in Rhode Island to sail the 635 nautical miles to Bermuda in one of the world's most pre-eminent sailing races. 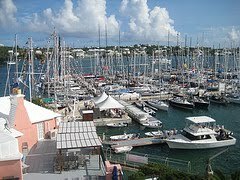 The first Newport to Bermuda race took place in 1904, and is therefore the oldest ocean race for amateur sailors. After leaving the harbour at Newport today the competitors then spend 6 days out at sea in the very cold water of the Atlantic. They cross the very unpredictable Gulf Stream, where the weather and the current presents a real challenge and many boats have in the past come a cropper. 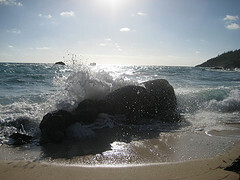 Then for 300 smooth miles the water warms as the yachts race for the reefs and the finish line of Bermuda. For the 4th season running Charlton kick off a new season with one of the promoted sides at home. AFC Bournemouth come to The Valley exactly 51 weeks after we went to them in a pre-season match. I was impressed with the Cherries then, and 32-year old Eddie Howe continued the fantastic job he started the season before after he saved them from relegation despite a 17-point deficit. Bournemouth finished runners up to Notts County, who we play at The Valley six games in. After Shrewsbury away in the Carling Cup we then go to Leyton Orient, where 3,119 Addicks made the journey east last season. My son and I will hope to make it this time around. Oldham Athletic with the loveable Paul Dickov at the helm are the next visitors to The Valley, then I guess we can forget about the 2nd Round of the Carling Cup (smiley thing) and we then spend two Saturday's on the road. Firstly Exeter and then up to fellow play-off failure's Huddersfield. Some other games of interest, in a third division kind of way, are Brighton at home on October 16th, Sheffield Wednesday at home on October 30th, Southampton at The Valley on Boxing Day with a last visit to The Withdean two days later and then a trip to Colchester on New Year's Day. Wednesday away is in January, Dagenham and Bournemouth away run concurrent in March, then we finish with a much 'easier' looking set of fixtures, although to be fair we made pretty light work of last season's tough finish. The Monkey Hangers come to The Valley on May 7th for the final game. I spent some time last night reading through the 'It's all going to hell in a handbasket' thread on Charlton Life and was going to write a post but to be honest I had drunk too much wine and then Dave did a better job this morning. The thread both depresses and buoys me. Depressing to watch the club I love hurtling back to the dark days of the 80's, one commenter suggesting that it reminded them of the rut that we could never get out off in the Gliksten era. But I am buoyed too by the love and passion of our supporters. For those of us that care, for those of us that following Charlton is not just about watching football but is deep rooted into our lifes, then we all have a responsibility. Together we can be quite a force, as long as we are together. Meanwhile our first round Carling Cup opponents will be Shrewsbury Town. The Shrews moved from Gay Meadow to the New Meadow in August 2007 and we go there the week beginning the August 9th. Since the eve of the South African World Cup I have seen cars in Bermuda flying the flag of South Africa, France, Mexico, USA, Netherlands, Brazil, Spain, Italy, Australia, Ghana, Argentina, Greece, South Korea as well as the more common cross of St George and the Bandeira de Portugal. There are thousands of Bermudians with strong Portuguese ancestry, mostly from the Azores and yesterday morning Portuguese workers downed tools (there was little gardening or construction work done I can tell you) and crowded into the Front Street pubs and watch their team struggle to a draw with Ivory Coast in one of the more duller games of a World Cup that risks being the dullest of them all. Let's be honest it's been a bit boring so far hasn't it? I've even preferred to do some work on occasion. Games are lacking goals, and those that are being scored are hardly crackers although Diego Forlorn has I think just scored the first goal from outside of the box. The ball's not helping, nor is the incessant drone of the bloody vuvuzela's. I spoke in favour of them at first but I've taken it all back! England's result is not looking too shabby now, put into the context of what we have since seen. Spain's World Cup record has never amounted to much, but losing to Switzerland earlier today was a huge turn up. The opening round of matches were very cagey, with avoiding losing the number one priority. Would it help if we just ditched the 32-team group stages and went straight into a knockout competition with replays if necessary? Will FIFA change it? Unlikely. It's also been sad to see so many empty seats at many of the matches, this despite 95% of all tickets said to have been sold and 110,000 foreign fans in the country. 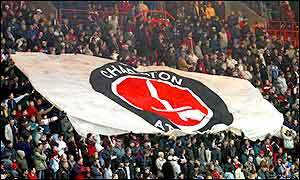 Maybe Robbie Earle had them or they are Charlton season-ticket holders who couldn't be bothered? It's certainly hard work watching England, cheering on those overpaid egos. The uneasy and alien slow build up lacking any of the adventure or passion our league football is renowned around the world for. In fact playing a USA! USA! team, that plays in the style of an old fashioned English team should have allowed our 'better' players to excel but it didn't. Lampard and Rooney were non-existent, the crossing from wide positions was poor and Carragher and Terry struggled embarrassingly against forwards from Hull City, Los Angeles Galaxy and Real Salt Lake. The Americans deserved a draw playing with a growing confidence after Gerrard gave us a dream start following a flowing move that later was beyond us. A draw is not the end of the world though in the first game, which should, I repeat should be the hardest first round game. Of more concern was Capello's team selection. After a qualification tournament when he got it so right, his efforts firstly to pick a 23-man squad and then a first XI yesterday looked hesitant and mismatched. Well the vuvuzela's are not bothering me, they might if I was sat next to a bloke with one at a game (don't get any ideas for next season Chris) but I think it adds to the World Cup experience, like the Mexican wave or the Argentinian tic-a-tape. The South Koreans are giving Greece a lesson at the moment, their couple of Premier League players, particularly Man U's Park Ji-sung are technically far superior than the Greeks. How they won Euro 2004 I will never know. The opening game was a cracker, Siphiwe Tshabalala's sublime finish deserving to be a winner, but I backed 1-1 so that was fine! 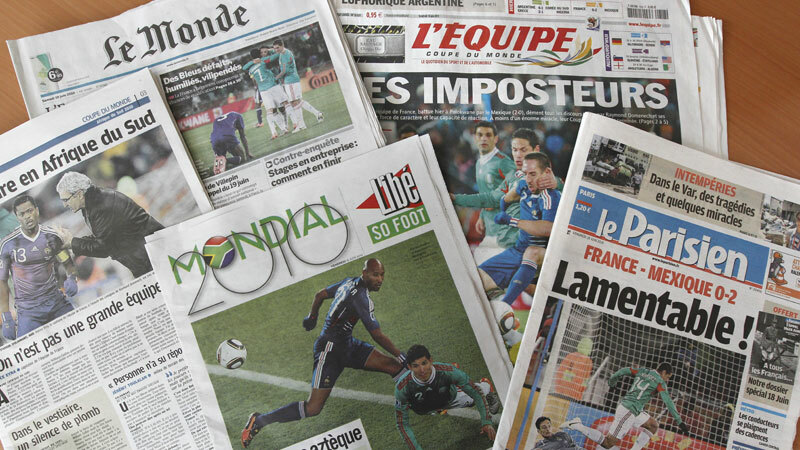 If the France v Uruguay game ends up being the competition's worse then I think we will all be happy. I'm looking forward to the Argentina v Nigeria game a little later. I fancy the Nigerian's to advance but Danny Shittu might not have slept so well when thinking about the Argentinan forward line. Then onto today's main course, England's opener againt the USA! USA! We are going to some friends who have invited supporters from both sides of the Atlantic. I have noted these last couple of days that our American brothers are getting a little bit chippy, let's hope we don't have to suffer the American media going overboard on a subject they know little about. Heskey looks like he will start, probably why I am not a football manager but I'd like to see Joe Cole play and think David James should be in between the posts for what it's worth. Never the most popular of the club's heirarchy so not surprisingly Steve Waggott's role as CEO has been terminated and from July Managing Director Steve Kavanagh will oversee the day-to-day running of the club. Waggott has faced a lot of stick from keyboard warriors including me on occasion, no one likes to see people lose their jobs but it was abundantly clear to most outsiders that with delicate finances (to put it lightly) a chairman, deputy chairman, a chief executive and a managing director was a tiny bit excessive. Some of the attacks got personal, which Waggott didn't deserve and taking the job over from Peter Varney was always going to be difficult, akin I suppose to replacing Curbs as team manager. Nonetheless the fact remains that the club is a far worser place now than it was when Steve Waggott took over. I watched the film Invictus recently, the story of the 1995 Rugby World Cup. It was a good film and it evoked plenty of emotions and memories of a country coming out of apartheid under Nelson Mandela, incredibly just 15 years ago. 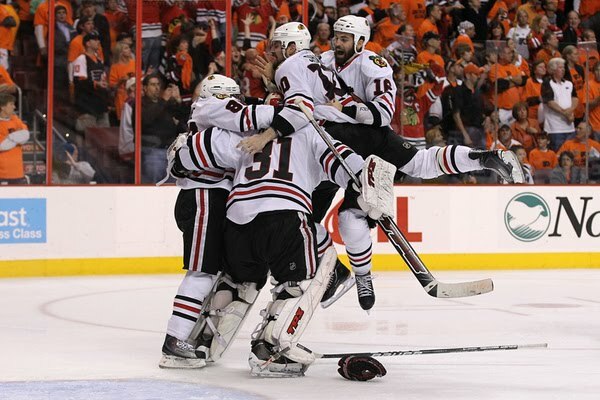 The Chicago Blackhawks are one game away from becoming Stanley Cup champions for the first time in almost 50 years. I watched Game 5 on Sunday night which kept me up way past my bedtime and the Hawks exploded into the action in the first period to take a 3-0 lead but the next two periods were back and forth with the Philadelphia Flyers with nothing to lose pinning the Hawks back but with the sell-out crowd hyperventilating Chicago led by the relentless Dustin Byfuglien kept pulling away to win 7-4, the first time seven goals had been scored in a Stanley Cup final since 2000. Tonight's Game 6 starts at 9pm Bermuda time. The World Cup suddenly hit me today like a Talal El Karkouri free-kick. My son was at home wearing his new top, and putting the bunting up in his bedroom, I stuck my wallchart up in the office and did my predictions and scribbled each game into my diary so I could plan the next four weeks of my life accordingly. 44 years of hurt then but it's hard to see an England victory, in fact it's hard to see beyond Spain and Brazil although I do have England making the semi-finals along with Argentina. I hope that the African countries proceed a long way through the competition. Nigeria look to have a decent path to the quarters and Cameroon led by Samuel Eto'o should be a threat in the 2nd Round. Drogba needs to be fit for the Ivory Coast to live up to their billing, but they have a bloody tough group to navigate first and finishing 2nd in Group G will probably pair them with Spain. How's your luck? And you have Sven-Goran Eriksson as your manager too! Ghana are bound to miss Michael Essien and I think Serbia will be too strong for the Black Stars in Group D, which like Group G has churned up a fantastic set of games. I have 400/1 shots Slovakia qualifying from Group F and I think the USA may well toil to qualify from our group. Beyond the starting XI the American's look desperately light and goals may well be a problem. I have Slovenia joining England in the 2nd Round. I also allowed my heart to rule my head and have the hosts make it into the last 16. South Africa will need beat Mexico to give themselves every opportunity but I reckon the French will choke under Raymond Domenech. In Group H, Chile had a strong qualification and include the prolific Suazo and I expect they will join favourites Spain where they no doubt will face fellow South American's Brazil in the Round of 16.... when did it become the Round of 16, at the same time as winningest?! Nani was the latest player to succumb to injury today and I'm finding it disappointing that so many top players might be missing. The next four weeks is a football pitch sized catwalk of the world's best players. Some will end the tournament with their names etched in our memories forever as adults revere them and kids copy them up the park. Others will be disappointments and won't live up to our expectations, whereas there will be a host of players that will come out of the shadows of squads and become household names and probably no doubt expensive Premier League signings by August. And you thought the Derby was at Epsom on Saturday? 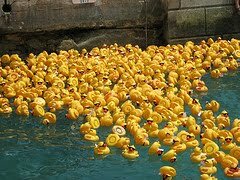 Oh no, the Rubber Duck Derby was yesterday in the historic town of St George's and we were intrigued enough to take a trip up there leaving our hats and tails at home. The weather was hot and there was little breeze but a few hundred others had turned out to watch the 14th annual running, or floating of the Duck Derby. It was all for charity and simply you buy a duck, have your name attached to it and then they are all almost systematically lobbed into the current at the little inlet at Ordnance Island and they float down under the bridge to the finish line. The winner collects, well I don't know what the winner collected because we'd left by then but we were assured there were prizes, some even worth re-packaging as gifts! The sight of hundreds of bright yellow ducks bobbing along the water being cheered on by the crowd was quite silly really, especially since the current was almost non-existent and the little wind there was, was blowing into the beaks of the competitors! 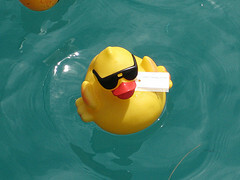 Helped by men in canoes and jet skis, slowly the ducks moved down towards the finish line where the winner, a handsome crested male with wrap around sunglasses, was greeted with cheers and I suspect a life in stud. The BP oil spill in the Gulf of Mexico is being played out in front of our eyes like a soap opera. BP even have remotely operated underwater vehicles (ROV) showing the world live feeds from 5,000ft below the surface. 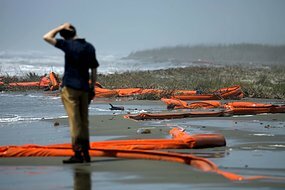 The amount of oil spewing into the ocean is frightful and sad. Emotions are high and BP are getting slated. For the first morning since the Deepwater Horizon oil rig exploded on April 20th, BP have announced some better news in that the latest containment cap is showing the first signs of promise funnelling off 10,000 barrels of oil to the surface. But since that fateful April day over 39 million gallons of oil have been poured into the Gulf of Mexico affecting 80,000 sq. miles of ocean. The coastal towns of Louisiana, Mississippi, Alabama and Florida watch with mouths agape. Computer models show that oil leaking from the damaged well could enter the Gulf Stream and move around the tip of Florida in the next few weeks and then travel as far north as Cape Hatteras in North Carolina, which on the American east coast is the nearest landmass to Bermuda 600 miles away in the Atlantic. Potentially the oil could reach Bermuda's pink shores but Friday the Environment Minister Glenn Blakeney allayed concerns by saying there is little risk of fresh oil reaching Bermuda. Nonetheless there is a threat related to the defacing of beaches by tar balls, but more significant is the potential damage to sealife and Bermuda's coastline from the use of powerful chemical dispersal agents being used in large quantities. On eight grand a week we should thank Yassin Moutaouakil for agreeing to having his contract torn up. I don't know many people who firstly would say no to a silly salary offer in the first place, and then agree to walk away short changed after being treated I think quite shabbily by his employer. If he was a bad influence, a bad egg, then show me some evidence, not just hearsay. It is rumoured that Moots took the £100,000 offered by the club, £316,000 plus expenses less than he would have received if he'd stayed and kicked his heels around Sparrows Lane for another year. Credit to the Frenchman for taking a gamble in throwing himself onto the out of work footballer heap, confident I am sure in his own ability. I for one hope he goes on to prove what a fine player he can be. I love the World Cup, and like Hungry Ted it was this festival of football that made a life-lasting impression on me. My first football memories were West Germany 1974, although I do have vague recollections of the fatal England v Poland game the autumn before. 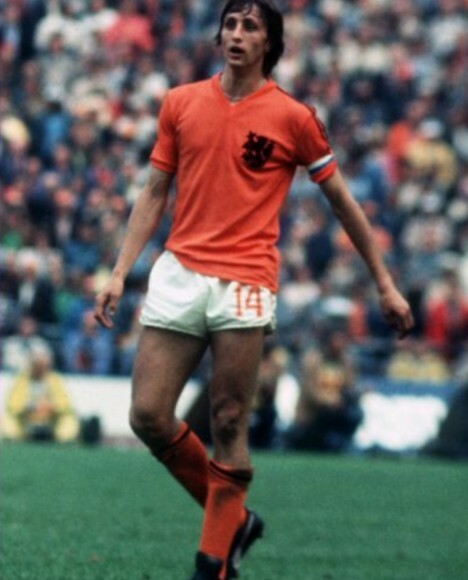 The orange-shirted Haan, Neeskens, Krol, Jansen, Rensenbrink, Rep, the Van Der Kerkhof brothers and my idol Johan Cruyff were in fact responsible for my falling in love with Charlton. It wasn't as complicated as it sounds. For a whole year after the 1974 World Cup I nagged my Dad to take me to football, to see close up this game that had enthralled me. Total football, the Cruyff Turn, the Arie Haan thunderbolt. My Dad took me to The Valley and the rest as they say, is history. The times of the games work out pretty well here (Bermuda is four hours behind the UK), and I plan to watch as much of the action as possible. Unlike four years ago when I was in Chicago, at least one can have conversations with strangers about football here. 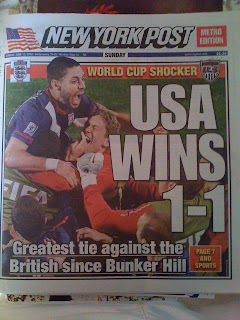 There was nothing more to bring on a bout of homesickness in America than the World stopping for a World Cup, while the majority of Americans concern themselves with baseball. Mind you ESPN have gone to extraordinary lengths this time to bring the beautiful game into the living rooms of Americans, which will please my collection of soccer-mad friends in Chicago. It pleases me also as it will ESPN's pictures that we will watch on television screens in Bermuda. Well the man who once while on loan at QPR had to help the interviewer with the prounounciation of his name never made a first team appearance for us, but he has made over 250 appearances for Blackpool, QPR, Watford and now Bolton. He is now out of contract and is available on a free transfer and turned a move to Turkey last week. Big Dan has 24 Nigerian caps and is expected to start alongside Joseph Yobo. Signed and sold by Alan Pardew, Magic has gone on to be quite a star at Rangers. Despite being born in France he decided to play for the country where his grandfather was born and has collected 40 caps. Algeria are of course in our group and he only made the final squad after declaring himself fit following a calf injury. Blackpool's Hameur Bouazza did not make the final 23. Judasssss!! Never liked the bloke personally and would slag him off at will to anyone who would listen when we regularly finished higher than Spurs. Defoe was always a shoe-in but despite him appearing to score at will (he got 3 hat-tricks this season) for the 5th season out of six the former Addicks academy player finished with less goals than a certain Darren Bent. Capello is likely to use Defoe as an impact player who has scored 11 goals in 40 appearances for England. Yep, possibly one of the worst players I saw in a Premier League patented Charlton shirt, the boy from the suburbs of Chicago is expected to start for the USA on Saturday week against England. I had forgotten that Spector was originally at Man Utd after being spotted while playing for the American Under-17's. A regular last season for both the USA and West Ham, he has played over 100 games for the Hammers and was on loan to us in the 2005/6 season starting just 16 games. One of our more popular loan signings. Many of us could see his talent during the 12 games the then 19-year old played for us at the end of our relegation season. Song went back to Highbury and was on the fringes until this season when he was a midfield regular playing almost 40 games. Song has 22 caps and is expected to start for Cameroon alongside his mentor and older cousin Rigobert. 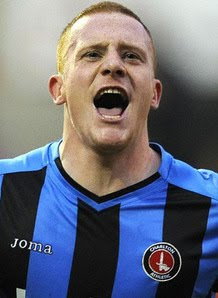 After playing just 17 games in three seasons for Charlton, Stephan went back to his homeland in 2007 and signed for Brøndby where he has been their first team goalkeeper ever since and is the club's reigning player of the season. Stoke goalkeeper Thomas Sorensen is first choice but he is still recovering after dislocating his elbow in a game at Chelsea in April, so Anderson may play in the Danes opening match against Holland. Not anymore. After beating the Philadelphia Flyers 2-1 Monday night they now lead the 7-game Stanley Cup series 2-0. This is a remarkable turnaround by Chicago's famous ice hockey team. When I was living in the windy city, the Hawks when not on strike were mostly an embarrassment. I remember on the odd occasion when I would go and watch them, the crowd would boo them onto the ice. The reviled previous owner Bill Wirtz priced tickets well over the top for what is the most working class sport in the city and sparse crowds would spread themselves around the 23,000 capacity arena. Nicknamed Dollar Bill, Wirtz also banned the Hawks from being shown on live television and the result was that no one cared a jot about one of the NHL's first six. There was no love of the team that were founded in 1926, just distant memories of the old days passed down from fathers and grandfathers. The Chicago media relegated them to also rans and to rub salt ESPN dismissed the Blackhawks with the humiliating title of "worst franchise in sports" in 2006. Quite a feat. But at the start of the 2007 season owner Bill Wirtz died after a brief battle with cancer. He had served as president for 40 years and few tears were shed amongst Chicago's sports fans. At the minute's silence to mark his death the crowd booed loudly and his replacement Rocky Wirtz, Bill's son was met with derison. However Rocky acted quickly to change his father's loathed and archaic policies. Rocky signed a television contract with local channel WGN and all games were aired live. Tickets were more affordable starting at just $15 and marketing and public relations improved. The game last night was the Hawks 101st consecutive sell out home game. The city started to fall in love again with the Blackhawks, trophy-less since 1961 and the longest drought of any of the NHL teams (as the Cubs is in baseball). Before we left Chicago we saw the Hawks play their last game of the 2008 season. It was like day and night. That team included it's youngest ever captain, then 20-year old Jonathan Toews and one of North America's best young players Patrick Kane. Today the Hawks is all Chicago are talking about. A friend of mine was at a Cubs match this weekend and told me there were more Blackhawks red shirts on show than the Cubs blue. The BBC followed Fabio Capello's squad annoucement today as if it was the World Cup final itself. Personally I was more interested in Crystal Palarse's future, which looks to have been rescued after CPFC 2010 agreed the outline of a deal to buy both the club and it's tatty old home. Darren Bent for the 2nd time in 4 years can book his summer holiday safe in the knowledge that Emile Heskey is considered likely to score more goals than him in South Africa, just like Theo Walcott was expected to in Germany in 2006. Scott Parker's absence is less of a surprise with Gareth Barry making the cut following an MRI scan today. More of a turn-up was Shaun Wright Phillips getting in ahead of the aforementioned Walcott, proving what an idiotic choice it was by Sven-Goran Eriksson four years ago. Stephen Warnock will carry Ashley Cole's divorce file after Leighton Baines froze in his chance to impress. Warnock has only played 6 minutes for England and that was two years ago. Emile Heskey's inclusion calls for all of us 'terrace football experts' to accept that we have not a clue. I watched his contribution after he came on as sub on Saturday against Japan. Fall over, kick the ball off, miss an open goal, yet Benty get's buried for not scoring a hat-trick in 45 minutes. I was left wondering why Carl Leaburn didn't get more caps. Meanwhile in the streets of SE25 young spotty boys with a collection of multi-coloured Palace home tops that would grace a Paris catwalk celebrated willdly at the thought of the tax payer helping to bail out their club, more back room staff getting made redundant and local businesses getting a few pence in the pound as for the 3rd time they look set to come out of administration. You know what they say. Once is unlucky, twice is unfortunate but three times is taking the piss. The deal is not yet done though and the next step in CPFC 2010′s takeover is to agree the Company Voluntary Agreement, which is not a formality. My sole long sleeved-top will deserve it's wash today after arriving back last night from a cold London Bank Holiday. My shorts meanwhile went back into the drawer unworn! I have come back into the office today to be welcomed by 'Man United Day', June 1st being the official day that my company takes over the shirt sponsorship. We have been receiving an email a day as the firm goes into excitement overload at the thought of paying $100m of United's debt off over the next 3 years, which is about 11% of their total. Meanwhile Crystal Palace face liquidation this afternoon unless they can find £4.5m. My London trip was short and sweet, untouched by football except for a kick-around on London Fields on Sunday with my son and brother. While I'm at it then, good on Millwall, they deserved promotion and I think Swindon staying represents a weaker Division 3 next season with Dagenham & Redbridge bringing with them what will be the smallest average attendance. At the end of last week in town I caught up with a lot of people and gossip on my traverses, a highlight being bumping into an old mate outside the Lloyds building whom I hadn't seen since 2003. Apart from the position of his hairline he hadn't changed at all, and we laughed for 10 minutes and swapped numbers. 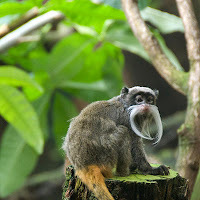 My son voted for London Zoo over the Museum of London on Saturday and ducking in and out of the drizzle we pretty much had the run of the place including the new Rainforest Life where Red titi and tamarin monkey's hurtled around us, stopping occasionally to stare back at us. Sloth's laze and armadillo's sauntered in the heat, whilst downstairs in the Night Life we watched as bats created shadows in the dark and rats scurried around as if in a tube station at midnight.